Carriers always throw around their mostly meaningless maximum downlink numbers. Realistically, all they are good for is comparing the advertised speeds with what we actually see because No one ever gets 14.4 Mbps downloads, not on NTT Docomo's highly regarded FOMA network, and not with Softbank Mobile. Personally, I consider anything in excess of 1000 kbps acceptable for a mobile network. Anything higher doesn't provide me with a perceptible increase in performance for what I do with my phone. What does make a difference is latency, the time it takes to actually establish a connection. By far, lower is better. Getting less than 100 ms on a mobile network is great. Less than 200 ms is probably typical. A much higher latency and the phone begins to feel laggy. The take home message is that the speed of a sustained data transfer is irrelevant if the time to actually start the transfer of each and every bit byte and pixel is ridiculously high. As a baseline, here is a speedtest this morning done on wifi at home with a Nexus One. There is just no way this is going to be beat by a mobile network any time soon. And, unless things have changed recently, no home ISP in North America is going to beat these numbers: latency, 23 ms; DL, 14 Mbps; UL, 4 Mbps. 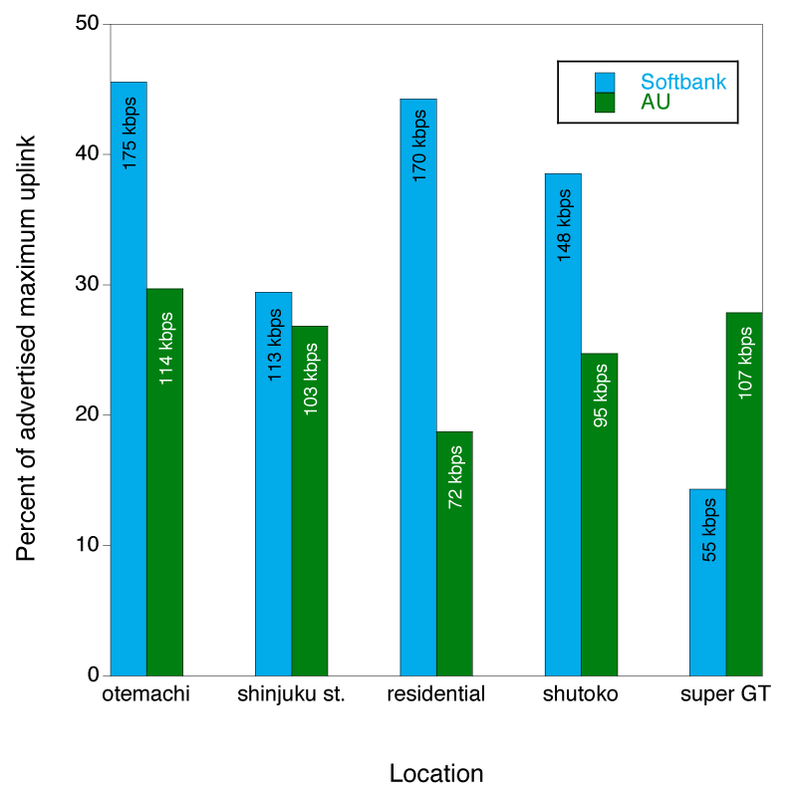 Yesterday, Ishikawa Tsutsumu put up another article in the Nikkei, this time doing a direct comparison of the iPhone 4S on AU and SBM. 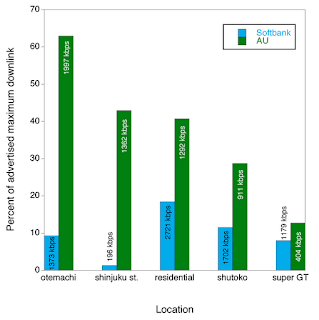 He does 10 separate tests at five locations around Tokyo and reports the average result. He concludes, unsurprisingly, that the phone just feels snappier with AU. The main reason wasn't so much a difference in throughput but in latency, which was five times higer with SBM (584 ms versus 106 ms on average). However, referring to the graph on the first page of his article, the raw numbers weren't really that bad for SBM, at least outside of Shinjuku, where the world's busiest station routinely brings Softbank's network to its knees. But, rather than just steal a graphic from the Nikkei, let's consider Ishikawa's numbers in the context of each carrier's advertising. At best, in a residential area of Tokyo, SBM delivered a 2700 kbps download speed, which is less than 20% of the advertised 14.4 Mbps. At the same location, AU clocked in at only 1300 kbps. 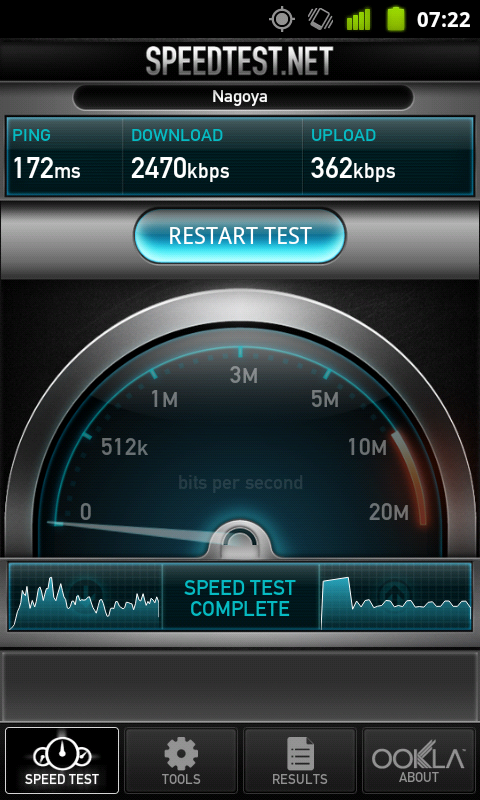 However, this is 40% of AU's theoretical 3.1 Mbps maximum, which is actually quite good. Furthermore, at Shinjuku station, where the SBM iPhone averaged a usable but frustratingly slow 200 kbps, AU provided about 1350 kbps. Neither AU nor SBM brag about their uplink speeds because, as far as I can tell, they are just standard 3G speeds under 400 kbps. 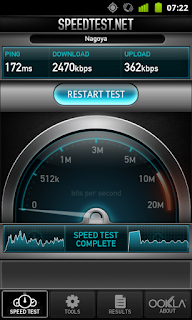 Docomo and Emobile support 5.7 Mbps uplink, but don't expect anything remotely close to this in real life. 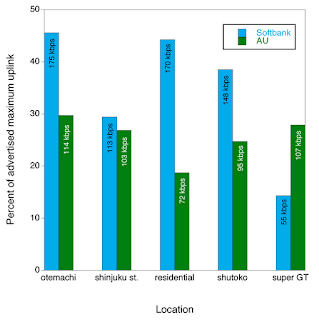 The fact that Docomo depicts their Kanto hi-speed uplink coverage area not as a map, but as a list of areas, tells us all we need to know - that high-speed uplink base stations are scattered few and far between in a sea of 384 kbps uploads. Getting back to the AU and SBM iPhones comparison, it is much more favorable in this department. Assuming a theoretical maximum of 384 kbps, SBM performs better than AU, delivering on average 35% of the advertised speed. AU is at 25%. Finally, here's what I got this morning (just one test) at home in mid-Tokyo. This is typical for me. The FAIR provides completely unrestricted access to Docomo's FOMA network. 172 ms, 2470 kbps DL, and 362 kbps UL. Basically, if you can't live without emoji, you'll need softbank until AU's mail system catches up. the @ezweb.ne.jp mail address can be used but it will be an imap system that gets checked every 15 minutes, instead of being pushed to the phone instantly. While out for the Super GT, he tried making calls from a rural, mountainous area in Tochigi. He placed twenty consecutive calls with each phone. After each call, he'd try and keep connected for 60 seconds. He had no problems with AU. SBM was horrible. It would take 50 seconds or so to connect, the phone would suddenly display "out of area," and he only succeeded in sustaining a call half of the time. While driving between Ibaraki and Tochigi, he did the same and had much better performance from the SBM iPhone, though still not as good as with AU. Of course he tried to used data during a voice call with the AU iPhone, which isn't possible with AU network. I mentioned this to you on Twitter, but I don't think that's true about upload speeds. I just ran the same test as you on SBM (with a HTC Desire, basically the same phone as your Nexus One) - It won't let me select the Nagoya server (I got Seoul) - but I got latency of 127us, Download of 1595kbps and Upload of 1107kbps. Here you have it from the man himself, Softbank max uplink is 5.76Mbps. OK - wrong about hsupa - that's what I get for trusting ja wikipedia when I can't find the info on SBM's own site. I think his test is biased. Even though AU has smartphones, I would guess that the number is less than Softbank, especially percentage-wise vs the rest of their subscriber base. Plus there are studies that show iPhone users use their 3G connection more than other smartphone users. The test should be run again in a year when the iPhone 4S has more penetration into the AU subscriber base. I would say that iPhone users and Android users use the same amount. Compared to Blackberry's that was all AT&T had as far as smart phones really ( don't count the old WinMobile junk). yes, I wonder the same. AU got really really late into the Smartphone-Game, and was never really the choice for Smartphone users. I bet that the vast majority of AU-users is still in their own i-mode world, and I really wonder if and how massive iPhone sales will affect their network. This is on consumer-grade, mid-tier Verizon FIOS Internet in Maryland, USA. 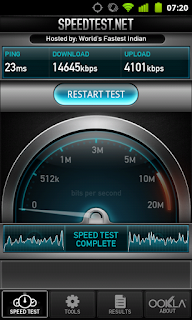 On a PC, I can get 25 Mbps, but my phone (T-Mobile myTouch 4G) seems to max out at 17 Mbps. Agreed with Nicholas that Android users will consume as much (if not more bandwidth) as iPhone users. Also agreed that AU came to the game late. Large coverage on TV tonight about the Docomo Xi announcements and the impending bandwidth crunch. There was even a graphic showing a traffic jam on the highway as a comparison to a congested network. Just ran some tests on my SIM free Galaxy S on Softbank using the HTC Desire APN here at work with about -75 dBm reception, and got down speed ranging between 2000 ~ 3600 kbps, and up speeds range between 4300 ~ 7097 kpbs (most repeated tests are around 5000 though). Oh, and inside subway tunnels, please. I have recently come to Japan and got myself the 1GB 定額 data only SIM card: despite living in Tokyo, I get pings in the 300 - 400 ms range and download speeds well below 1 mbit (300 to 500 kbps is my usual average). Why is it so bad? Is it just Docomo's network being slow or is it the proxy b-mobile uses for these SIM cards? Also, my phone is a SIM free HTC Desire bought in the UK and running the latest stable Cyanogenmod (based on Android 2.3.7): after flashing I got the signal strength meter to work but still no 3G icon. The real issue is power consumption: I can barely get a day worth of moderate usage from the handset, with most of the power being sapped by wireless standby. Is there any way of fixing Android to make it work properly with B-Mobile SIM? I'd like to confirm a few things about the iPhone 4S sold by KDDI au. Would much appreciate a response. 1) The phone has two SIM card slots: one for CDMA and one for GSM (microSIM). Correct? 2) au provides a GSM SIM along with the CDMA SIM, both of whoch are linked to the same phone number. Correct? 4) The unlocked phone will accept a B Mobile microGSM card (well, WCDMA, I suppose) and thus work on DoCoMo FOMA. Correct? 5) On an unlocked phone, the user can manually switch between networks (supposing the phone does have dual SIM cards which I am not sure about). Correct? 6) Which unlocking service has been tried and tested successfully on the 4S from au? Unfortunately, I doubt a lot of those points would be true. BUT, I do not own an iPhone on any network. AU usually has SIM compatible UIM cards but I doubt they would put two UIM in the device. Furthermore, AU's network is generally incompatible with the rest of the world. So what's in the AU iPhone? Giving that AU is different from other networks, it probably has a different radio than other iPhone devices. I think the iPhone should be radio compatible with some CDMA/GSM/UMTS networks but will they let you unlock it? Also I don't think UIM cards will automatically work if you just swap them around (except that you can put your AU UIM card into SIM compatible phones to pay AU for using those other phones when travelling). I've heard that they need to update something in their system when you swap UIMs. 6 = I've never really heard of people unlocking AU phones... usually just unlocking Docomo and Softbank phones. Try going to an au shop and asking them about the UIM cards. You can confirm that directly with them. Although for travel, they will recommend you pay them a lot of money and use their "Global Passport" services.